“Perfect!” That’s what Sparky announced after I dished him up a steaming bowlful of this kick’n good soup. 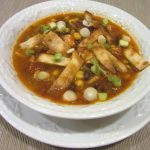 I have been fussing with Chicken Tortilla Soup for years trying to get it right. It was always real tasty but it wasn’t until yesterday that it hit the “perfect” mark. And I agree with Sparky. This is the real deal! And it is a breeze to prepare and ready to serve in less than one hour. Ready? Let’s build us some Kicked Up Chicken Tortilla Soup. You’ll notice that I have home canned tomatoes and frozen chopped green peppers. Well, that’s because we canned our own tomatoes this Fall and I take advantage of inexpensive green peppers during the summer and freeze them for use over the winter. Use what you have. Fresh, frozen, canned, home canned. It’s all good. Full of flavorful vegetables in a light tomato broth and spiced just right, I'm sure this will become a favorite at your house too. Just enough heat that's balanced with the smokiness of Cumin makes this a real winner. A great warmer upper for the cold months ahead. 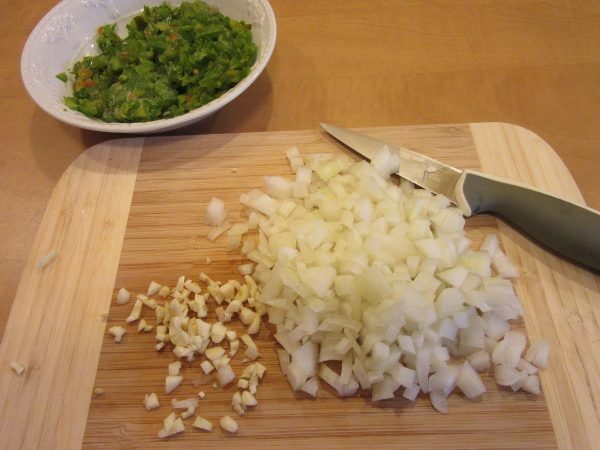 Place 2 TBLS Canola Oil in a large soup kettle.Chop the Onion and Green Peppers. Mince the Garlic and add all 3 to the soup kettle. Over low heat, saute' until soft. 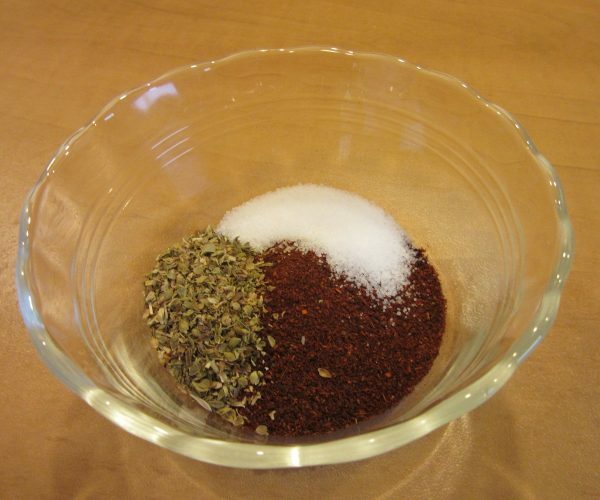 Combine the Chili Powder, Oregano, Salt and Cumin and set aside. I love pre measuring spices 'cause they look so pretty! Chop up the tomatoes if you are using whole ones. See how fancy I do it? LOL! 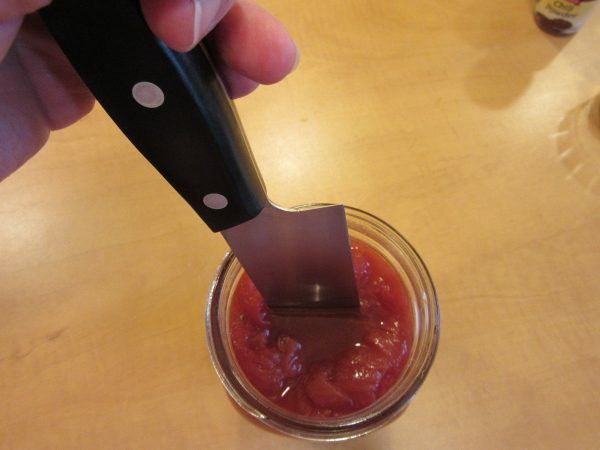 I just take a knife and chop it up and down inside the jar. It works just fine! 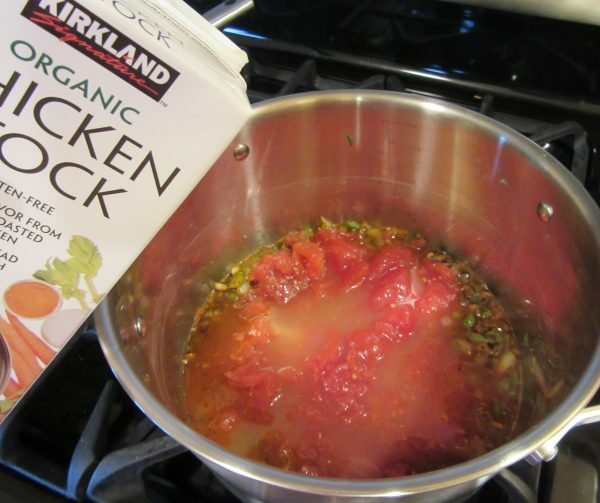 Add the Chicken Stock, Tomatoes, and measured spices to the kettle. Bring to a boil, lower the heat and let it simmer for about 10 minutes. Add the Corn and the Black Beans and stir well. Heat the remaining 1 TBLS Oil in a skillet until hot. 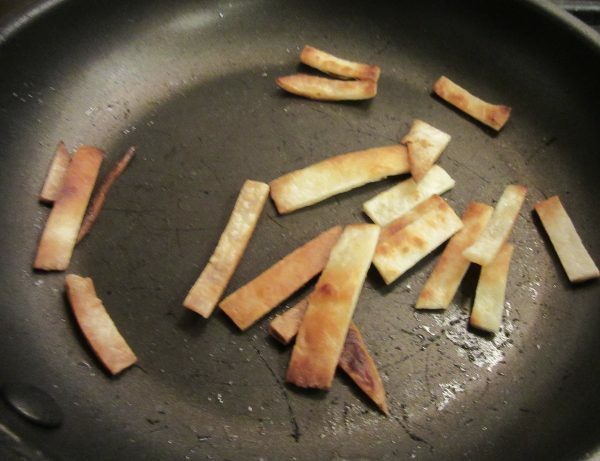 Add the sliced Tortilla strips and cook until brown and crunchy. 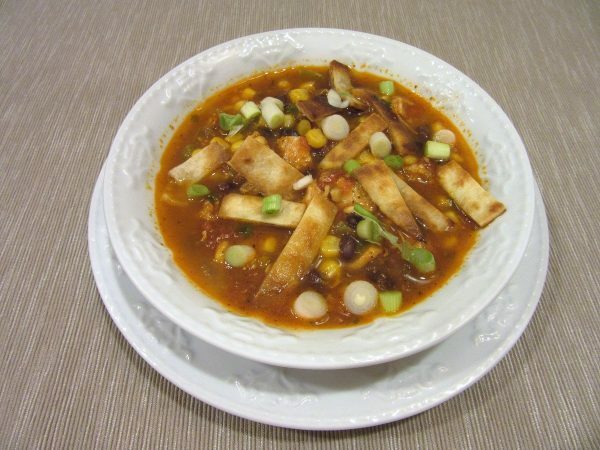 When you're ready to eat, ladle the hot soup into bowls, sprinkle with sliced Green Onion and top with crispy Tortilla Strips! That's it. Enjoy!! Thanks for stopping by today! Wherever your journey takes you on these cool crisp Autumn days, I wish you the warmth of a shared meal with loved ones. Follow me at: www.thejourneygirl.com and leave me a message. I'd love to hear from you. 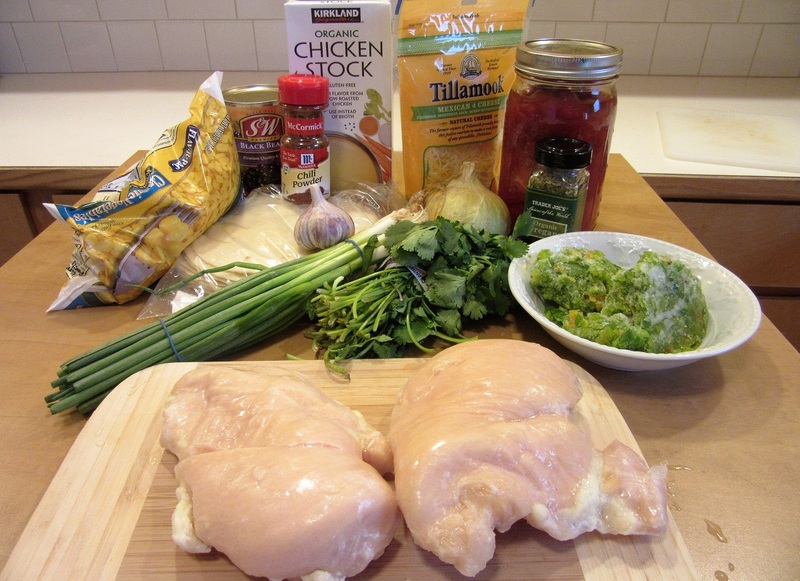 I know some of my friends are highly observant and you will notice there is Cheese in the picture of the ingredients. Well, I deliberately did not add any Cheese and we both think the Soup is better without it! 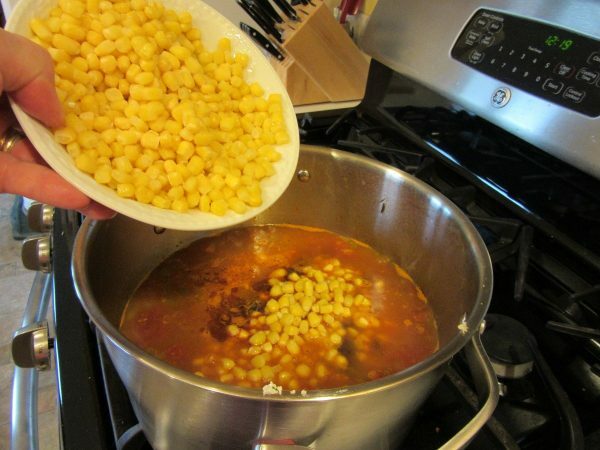 Hi Karen, I’m so glad you mentioned your food blog because I need a new recipe for this weekend and I’m so excited to try this one out! So nice to have met you! 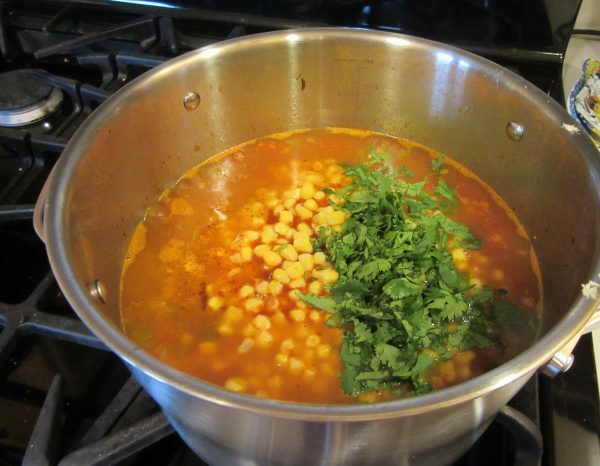 This is one of my favorite soups and I hope you enjoy it. Thanks for the reminder. I think I’ll make a kettle full this weekend too!